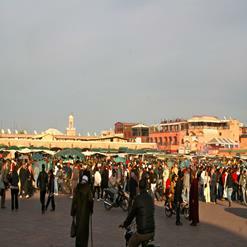 Musée de Marrakech or Marrakech Museum contains the modern as well as traditional Moroccan art. It's housed in the beautiful Dar Menebhi Palace which was built by Mehdi Menebhi at the end of 19th century. The museum's collections include archaeological objects, ethnographic objects, contemporary art and historical documents. It has Islamic coins, ceramics, jewelry, costumes, weapons and a large number of Moroccan paintings.